Drawell - WD 460 :: Tashoil Company Pvt. 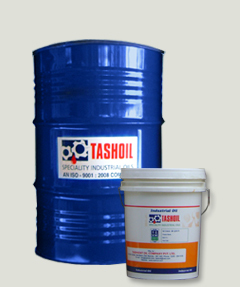 Ltd.
Tashoil Specialty Oil WD-460 is one of the most commonly used wire drawing oil in your industry. It is mainly formulated with EP (Extreme Pressure) additives to give extra lubricity, a higher Viscosity Index, which ensures low rate of die wear, cooler working and better finish to the reduced aluminum wire drawn. The product lubricity is increased keeping in mind the process. In this process metal instead of being cut or machined, is forced to flow to acquire the desired dimensions by the use of suitable mechanical equipment like dies. This metal forming process includes operations like pressing, stamping, deep drawing, wire drawing, tube drawing & forging.